I have comments about the art, first and foremost... That looks nothing like Jace. And Vraska... it looks something like her, I suppose. I mean... The Duel Deck art of Elspeth, Knight Errant looks like Elspeth Knight Errant. All versions of Elspeth look like Elspeth. Same thing goes for all the other planeswalkers. This looks like Snapcaster Mage cosplaying as Jace. Anyway, this art is by the talented Igor Kieryluk, the artist behind the Duel Deck Elspeth, Knight Errant and the the original Tezzeret, Agent of Bolas. He also did the art for Geist of Saint Traft and Griselbrand. He also did the art for Jace's Ingenuity from M11, which personally represents Jace more than this art... 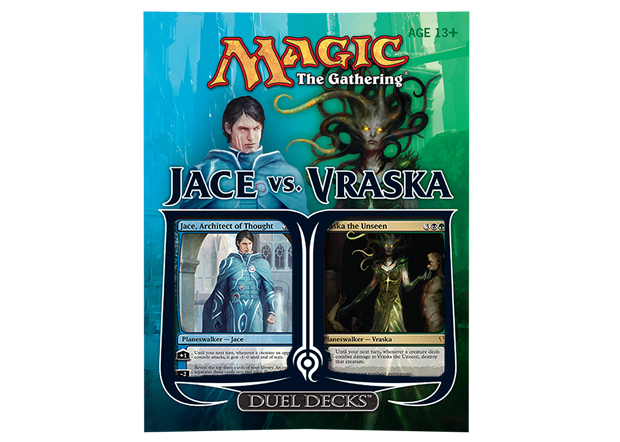 I do like how Vraska looks like she just turned a few people into statues. Still, a Blue vs. Black/Green duel deck will be interesting to see. Jace's deck may wind up with a second color, though. I'm thinking counter spells and milling versus scavenge and return from the graveyard triggers. Okay i disagree with this duel deck mainly because in the Secretist: Part 3 there is an actual battle between Jace and Ral Zarek. Also i don't believe he will be milling in this deck for a few reasons: 1. Jace is no longer an evil mind sculptor like he was when he was with that evil planeswalker gang, 2 Jace would if chose any color to work with here it would be white because he's all about saving Ravnica and all that just stuff, 3. 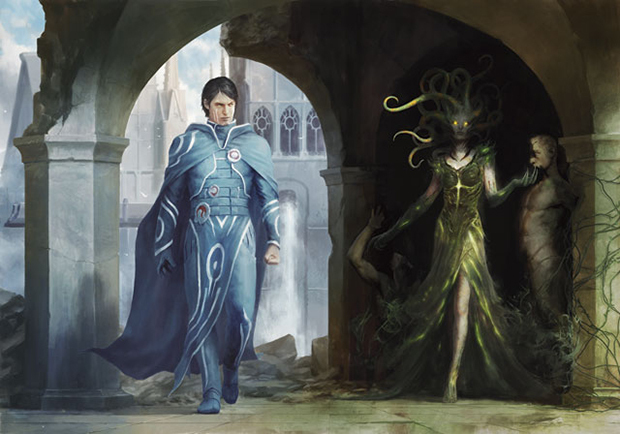 Jace would probably not chose another color because in the Secretist series he goes out of his way to make sure that he does not chose a guild he for: He was attacked by the Dimir, was racing against the Izzet, was offered to join the Azorius, and Jace doesn't seem like a Simic Biomancer. Well that's all my ideas.